Successful change in the public sector can be supported or hindered by political and administrative leadership, individual and group motivation, and the public's perception of the effectiveness of public officials and government structures. But do the very characteristics of public sector organizations present obstacles to successful transformative change? This book assesses the current state of the literature on leadership and change in government and public policy, and introduces the reader to innovative new ways to demonstrate leadership in times of change. Contributions from accomplished scholars in the field cover the traditional public administration areas of performance and management, as well as the diversity of issues that surround public leadership and change, both domestic and global. Chapters on public sector innovation, performance leadership, governance networks, complexity in disaster management, change initiatives in educational systems and local government, citizen advisory bodies, and gender and race equality, to name but a few, provide important case studies throughout the volume. 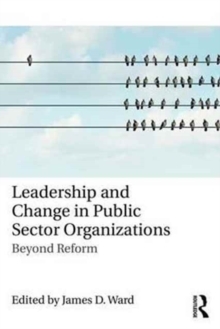 Leadership and Change in Public Sector Organizations will be required reading for upper level undergraduate and graduate courses in public administration/management, leadership, and public policy analysis.